It had been a while since I’d seen Mater Dei, but they are back to their own dominating and formidable game plan. Today they were at the annual Westside Challenge at Santa Monica High School, and they took on Bishop Montgomery – usually a strong team that is fundamentally sound. But it was pretty obvious from the warmup how things were going to end up. Besides making the Knights look like pipsqueaks with their taller, wider, imposing selves, MD ran a really professional warmup. The starters and immediate reserves did the slide-and-squeak-their-shoes-with-hands-up drill, then ran layups circular style, at a fast pace. The remaining six players (there are 18 on the team) who are deep reserves did a separate warmup near mid-court that consisted of sprints and a dynamic warmup. Bishop started out scrapping and pushing; bless their hearts. They really did try. But they had no answer for the Monarch’s full-court press. I mean, there was none. The example of this foremost in my mind occurred right in front of me. Alexyz Vaioletama, who has signed with USC, and Kaleena Mosqueda-Lewis, a soon-to-be UConn Husky, trapped a Bishop player on the side of the court by continuing to advance two steps at at time. Squeak-squeak! Pause. Squeak squeak! Pause. Squeak squeak! The Knight turned the ball over. Mater Dei had their faults. 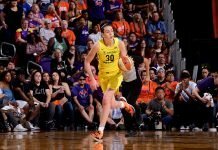 In fact, they were missing many shots – especially Mosqueda-Lewis – who somehow still collected the “player of the game” award for her team on the night. There were two times I can think of when the Monarchs got four rebounds in a row and still couldn’t put the ball in the basket, under the basket. But they were getting all the offensive boards, which is the point. Mater Dei’s strengths are that they play together as a complete unit, and they all have 100 percent court vision. 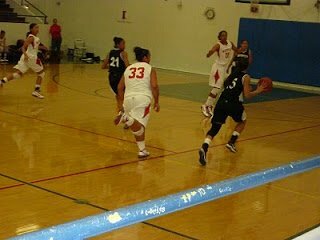 One athlete knows where her teammate is before she even turns around, and is ready to pass the ball to her. 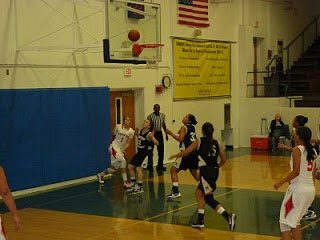 If a player is about to miss a shot, two other players have already seen that the shot is off and are under the basket to get the rebound. It’s really something. I wasn’t going to watch the whole game, but found myself staying for the “wow” factor. The Monarchs look much better than when I saw them lose to Long Beach Poly in November. #33 Jessica Duarte takes the ball inside as teammates Jordan Adams and Alexyz Vaioletama watch. Players scramble for the rebound in the first quarter. Adams and Kaleena Mosqueda-Lewis on the run. Bishop’s Kristen Ale storms up the court in the second quarter, with Duarte in hot pursuit. Adams tosses it up and in. #21 Airiona Sampson throws it up as she is boxed out by Vaioletama. 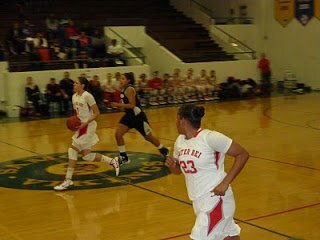 The suffocating Mater Dei press: Mosqueda-Lewis and Adams trap Dani Lee in the back court.